UNITED NATIONS, March 5, updated March 6, 10 am -- As questions grew about the UN Development Program's decision to suspend operations in North Korea, the UN's humanitarian coordinator on Monday said UNDP's program have had little humanitarian impact, and that other UN programs should be able to "operate reasonably normally" in North Korea. Video here, from Minute 35:46. But since other UN funds and programs pay -- in hard currency -- through UNDP, and since UNDP's Timo Pakkala is the Resident Representative of the UN in North Korea and will be pulled out of the country, the story is clearly far from over. Ironically, on March 13 Mohamed ElBaradei of the UN-affiliated International Atomic Energy Agency will travel to Pyongyang, from which UNDP is departing. Monday at Ban Ki-moon's spokesperson's noon briefing, numerous reporters asked questions about UNDP's stealth suspension of operations on March 2, while not announcing it to the press or public beyond an update, dated March 1, slipped on its website. Inner City Press asked if the suspension has the effect of slowing the "urgent audit" which UNDP called for. It remains Inner City Press' understanding that this is the effect and, sources say, intent. This analysis is missed or disagreed with the Wall Street Journal and by a Congressperson who congratulates the UNDP Executive Board for suspending operations. Currently it appears that Mr. Kemal Dervis probably made the decision to suspend, and made the decision to not announce it to the press. Question: I just wanted to follow up. As I understand it, the UNDP�s statement was posted on their website but I don�t think that we got any announcement. I would like to put in a request that on announcements, such as this, those announcements should be made to us, not just posted. We don�t go and read the UNDP website all the time. Spokesperson: Well, I think we have someone from the UNDP here. I�m not sure. Yes, we do have Jim back there and he will be glad to answer your questions right after the briefing. But Mr. Morrison never came to the rostrum. Rather, between the noon briefing and a previously scheduled briefing by new Under Secretary General of Management Alicia Barcena, Mr. Morrison conducted what he called a scrum in the hallway outside the briefing room. Later he stated to Inner City Press, in response to still-unanswered written inquiries, that "all questions" had been answered in the scrum, which Inner City Press could not attend due to the Alicia Barcena briefing, click here for video, starting at Minute 33:08, and here for Inner City Press' story. "This is just to note that you have your facts wrong: I began the briefing outside of 226 AFTER the noon briefing was complete, i.e. after the segment with Ms. Barcena. I did this so that everyone could attend." Out in the hall, Mr. Morrison apparently told Reuters that unnamed North Korean "officials want to discuss again a further narrowing of the program." Mr. Morrison is also quoted with a number -- $4.4 million -- that is different than Ad Melkert's previous provided figure of $3.2 million as UNDP's 2006 expenditure in North Korea. Which is it? Mr. Morrison wrote, "I�m responding to the questions you�ve sent to Timo, Hafiz, etc. on DPR Korea. It�s a shame you didn't come to the scrum I did outside of 226 following the noon briefing, as I answered all questions at that time." Inner City Press immediately replied with specific written questions, not one which have been answered. Some of the questions were also posed directly to spokespeople for the Secretary-General, although one these incongruously referred the questions to the South Korean mission to the UN. Whatever it takes, wherever we have to go, we'll get to the bottom of this. 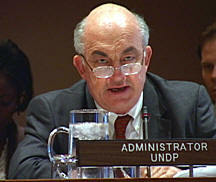 For now, click here for UNDP's Kemal Dervis' March 2 letter to the North Korean mission. As with the U.S. mission inquiry, it was Ad Melkert rather than Mr. Dervis who attended and spoke at the meetings. Where is Mr. Dervis? The time has come, as Inner City Press has requested, for a Kemal Dervis press conference. UNITED NATIONS, March 3 -- The UN Development Program, facing an "urgent audit" of its North Korea operations called for by UN Secretary-General Ban Ki-moon, has now suspended its operations in the country. Sources tell Inner City Press that the effect, and even intent, of the suspension is to slow or stop the audit. The stand-off shapes up as a test for Ban Ki-moon. On January 19, Mr. Ban called for an urgent audit of UNDP and other funds, programs and agencies. On January 22, he limited the initial scope of the audits to North Korea and unspecified other countries where hard currency payments and government influence on hiring and blocking of auditors' access might be issues. Mr. Ban said that audit would be completed in 90 days or less. On January 25 at UNDP's Executive Board meeting in New York, a compromise was passed under which UNDP was to modify its programs in North Korea on or before March 1. North Korea, which has a seat on UNDP's 36-member Executive Board, did not vote against this compromise. Inner City Press exclusively confirmed the presence in New York of UNDP's North Korea resident representative Timo Pakkala in New York on February 8, by calling his room at the Crowne Plaza hotel. On February 12, UN Controller Warren Sach confirmed to Inner City Press that he had met with Mr. Pakkala in advance of the audit. Ban Ki-moon's spokesperson on February 20 confirmed that the 90-day clock has started. As of 1 March 2007, UNDP has no choice but to suspend its operations in DPRK as the necessary conditions set out by the Executive Board on 25 January 2007 have not been met. These conditions included adjusting the content of the current Country Programme (2005-2006) and the proposed Country Programme (2007-2009) for DPRK to support sustainable human development objectives; ending all payments in hard currency to government, national partners, local staff and local vendors and discontinuing sub-contracting of national staff via government recruitment as of 1 March 2007. UNDP's position in DPRK could be reconsidered if these circumstances change. Source point out that North Korea's seat on UNDP's Executive Board could be in jeopardy, given its seeming refusal to comply with conditions voted by the Board. UNDP does not specify in its statement -- of which Inner City Press was not told, despite an email from Kemal Dervis spokeswoman on another UNDP matter on March 2 -- which of the three conditions was not met. UNDP has said it will not answer about North Korea until the audit is completed. Now Inner City Press is told that when the terms of reference of the audit were passed by UNDP to North Korean officials, the Kim Jong Il government responded with conditions, that no onsite access would be granted, and that they wanted the right to approve who would do the audit. Sources say that auditors, including Imran Vanker and others, have predictably responded, "no audit without access." What then of the 90 day time clock? Pre-audit, sealed with a handshake? Inner City Press' questions to UN Controller Warren Sach have been responded to by a message that Mr. Sach is out of UN Headquarters until March 12. He is described as being "on mission," though no location is specified. It has been pointed out to Inner City Press that South Korea, including while Mr. Ban served as foreign minister, was a not insubstantial funder to North Korea, including through UN-affiliated funds, programs and agencies. UNDP, meanwhile, has said that it will not answer questions about North Korea until the audit is completed. Whether that essentially means "never, we'll never answer questions," remains to be seen. Much of the audit could be done of papers in UNDP's New York headquarters, in the offices of such officials as Darshak Shah, Hafiz Pasha, David Lockwood and Bruce Jenks. Some within UNDP are calling on Ban Ki-moon to remove immunity from such officials, so that a robust investigation can occur. Developing. Matthew, Regarding your February 8 questions about UNDP and the DPRK: As you know, UNDP's operations in DPRK are undergoing a thorough audit. We welcome this audit which will enable us to take additional management action as needed. Until the audit is completed, it would not be appropriate to comment on our work there beyond what we have already said in the statements of January 19 and 25. (http://www.undp.org/dprk). Presumably this invocation to the right against self-incrimination, embodied in the U.S. Constitution's Fifth Amendment, continues and is also directed at the still unanswered question Inner City Press directed to Kemal Dervis on February 1, and reiterated to Ad Melkert in the middle of February, namely, how many money has UNDP processed, for itself and other UN agencies, in North Korea? If it takes a full second audit to even venture a numeric response to this simple question, something if very wrong indeed. Dear Mr Lee, Thank you for your e-mail of earlier this morning which is hereby acknowledged. 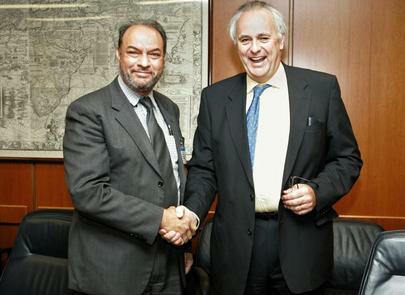 I did meet with UNDP's Resident Coordinator for North Korea, Timo Pakkala on Friday 9 Feb. I advised him to contact the Executive Secretary of the Board of Auditors, Mr Anand Goolsarran to coordinate on logistical arrangement for the forthcoming audit. Mr Goolsarran would also be the best person for you to contact re Board of Auditors matters. The ACABQ Chairman, Mr Rajat Saha has written on Friday 9th Feb requesting that a special audit be conducted by the BoA in N Korea. This followed my own formal request to ACABQ that the BoA be requested to undertake an audit; in connection with that request the ACABQ held separate hearings on Wed 7th Feb with both myself and the representatives of the BoA on the request for an audit. I do know if the BoA has yet begun the audit; I suspect they have a number of logistical steps to take before field work begins; Mr Goolsarran can best advise you. Hello... When will the audit(s) actually begin? We have heard a date of February 16. Is that correct? Who will perform the audit? ... Have you spoken with Mr. Pakkala? We are also informed that you met with the ACABQ on February 7. In the two meetings, what logistical arrangement were arrived at? Can you comment on the fact that the DPRK issues were not mentioned in the most recent publicly available audit of UNDP, which also refers, on Russia, to a document being "released" when it is nowhere available? Will the audit include other agencies such as WFP, UNFPA, WHO, FAO and others? If limited to UNDP, will it include the money that UNDP pays on behalf of other agencies? Will any agencies be audited in geographies beyond the DPRK? If so, when? There has been difficulty for the press in getting even basic information. UNDP, for example, has most recently told us regarding all North Korea-related questions, including a simple total figure of money UNDP handled for FAO, UNFPA and other UN agencies, that "Until the audit is completed, it would not be appropriate to comment on our work there..." In your position with the Board of Auditors, do you think it is appropriate for a UN fund or program to cite the existence of one of your audits to, in the American vernacular, expansively invoke the Fifth Amendment for at least 90 days on a wide range of issues of public concern? Note that UNDP has also neglected to answer simple factual questions about issues entirely unrelated to North Korea. I will be out of the office starting 28/02/2007 and will not return until 12/03/2007. UNITED NATIONS, February 20 -- A month after Ban Ki-moon called for "urgent" audits, beginning with the UN Development Program in North Korea, his spokesperson was asked if the audits have begun. While the spokeswoman said she wasn't entirely sure, she said unequivocally that Ban Ki-moon's 90-day clock, for the audits to be reported on to the General Assembly, has begun. Click here for video, and transcript below. Meanwhile Pakistan's Ambassador Munir Akram told Inner City Press that he and the Group of 77 feel that "there is an issue of how well we are able to have oversight over the funds and programs" like UNDP, and whether the Executive Boards are effective. Inner City Press had asked about the G-77's call for at least two UNDP reports to be withdrawn, for lack of consultation with the Executive Board and the General Assembly. Could there be a relation between these two problems -- the behavior by UNDP in North Korea which Ban Ki-moon called on to audit, and lack of oversight of UNDP -- and what can be done about it? Amb. 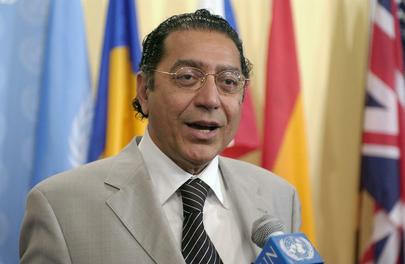 Akram referred to the development cooperation forum of the UN's ECOSOC. Video here, Minutes 29:48 through 31:28. On February 15, Inner City Press had the opportunity to ask UNDP's Ad Melkert to release at least the already-finalized numbers reflecting expenditures in North Korea. Mr. Melkert said that it is important to distinguish between money spent for UNDP, and that spend by UNDP for other agencies. Certainly. But what is the number? On other, non-North Korea matters, Mr. Melkert indicated that an attempt will be made to provide responses on a more timely basis. We'll see. While awaiting this new information-providing regime at UNDP, and while awaiting a number of long-delayed responses from UNDP, the rest of today's UNDP column, we'lldevote to a letter to the editor from inside UNDP, handwritten but on substantive issues. It begins with praise, which we're suckers for. "My dear friend, you are going an incredible job. Now ask UNDP and its board members, why Pippa Norris and Nora Lustig, the two new managers appointed by Kemal Dervis, have changed policies previously approved by the Board, without consultation? Why is Norris allowed to neglect important areas of work for UNDP - human rights, gender, decentralization? Why is Norris making of UNDP an institution concerned only with economic governance and Central Bank regulation, when this is typically a task of the World Bank and IMF? These are hobby areas for Kemal. Why is Norris using UNDP's (and taxpayers') money to finance her participation in academic meetings that have nothing to do with UNDP's work? Why UNDP as a UN neutral agency is providing financial assistance to political parties? Why is UNDP abandoning its work on governance as in the past, as approved by the Board, to focus no on parliaments, elections?" Click here for Inner City Press' story from last week about Liberia. We've left it to the absolute end of this report to note an employment move which we've known of for some weeks, but were told about by other journalists today, triggering this brief update. Former Spokesman for the S-G Stephane Dujarric, after a brief sojourn in the Dag Hammarskjold Library, is now "helping out" at UNDP. They certainly could use the help. Might it possibly result in more timely answers to simple questions to UNDP, as projected on February 15 by UNDP Number Two Ad Melkert? Here's hoping. Inner City Press: Does the 90 days -- because he said it should be done in 90 days -- does the 90 days run from when he announced that the audits would begin or from when they actually began? Spokesperson: Actually, I know that -- yes, they have started it. Question: Which ones have started? Spokesperson: The external auditors have started on the process. Question: But could you specify? I mean, there�s a lot of agencies to be audited. Question: You say they have started. You mean the one in North Korea? Question: The clock is running? UNITED NATIONS, February 14 -- Even as the UN Development Program held a press conference with Russian tennis player Maria Sharapova on Wednesday, questions were asked and left unanswered about the "scandals" at UNDP. Ms. Sharapova was asked if she was aware of the "scandals," and she said, "Yes, I am aware, but I'll let them talk" on the issue, gesturing at Associate Administrator Ad Melkert and Communications director David Morrison. But Mr. Melkert declined to provide the requested figure, of how much UNDP spent in North Korea including on behalf of the World Health Organization, the UN Population Fund, the Food and Agricultural Organization and others. Inner City Press asked Kemal Dervis for this number on February 1, and has reiterated it in writing to UNDP several times since. On Tuesday, February 13, seeing Mr. Dervis on Ban Ki-moon's schedule at 3 p.m., Inner City Press asked if Mr. Dervis could take questions after that meeting. While the spokesperson said she would check into it, her office later said that Mr. Dervis had said no. On First Avenue at 2:55 p.m., as Mr. Dervis and two associates including spokeswoman Christina LoNigro strode, as it were, toward the Secretariat building, Inner City Press greeted Mr. Dervis and said, "There are some requests that you take questions after your meeting with the Secretary-General." Mr. Dervis replied that he had another appointment after Ban Ki-moon, shrugging, apparently apologetically. And so on Wednesday, the question was posed to Ad Melkert, for the simple number, how much UNDP expended in North Korea in 2005 and 2006. Inner City Press apologized for having to ask it, due to the previous non-responses, during the tennis-heavy press conference. Mr. Melkert, who previously had spoken of transparency, said "You can ask, that is not a problem... It seems to me logical to wait for results of that audit and then look into all questions that may still be outstanding then... including answers to your questions." Video here, from Minute 16:37. Inner City Press noted that a simple number should be available without waiting another 90 days. Particularly as to 2005, for which UNDP's vaunted computer has long ago closed the books and the General Ledger. If UNDP is not confident in these numbers, there is a major problem. Or perhaps UNDP sees the audit as a blessing in disguise, as providing a rationale to no-comment the issue for at least three months. We'll see. As noted, there are non-North Korea questions which are not getting answered, either.